Made with materials from SALT, be inspired in Christmas Activities with this collection of service resources. Need inspiration for this year's Christmas all-age services? 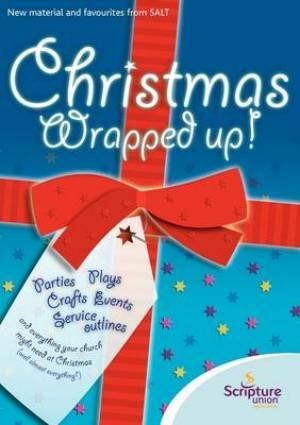 Christmas Wrapped Up gives you everything you need for Christmas parties, plays, crafts, events, service outlines, and everything your church might need at Christmas! The ultimate Christmas resource book which really does contain practically everything a church might need for Christmas time. Packed full of top-quality material combining years of Scripture Union experience with exciting new ideas, it will help churches get the most out of Christmas this year and for years to come. At last - the ultimate Christmas resource book! It really does contain practically everything a church might need for Christmas time from service outlines to parties and games. Christmas Wrapped Up! by Scripture Union was published by Scripture Union in September 2003 and is our 11271st best seller. The ISBN for Christmas Wrapped Up! is 9781859997956. Buy Together Offer for Christmas Wrapped Up! Reviews of Christmas Wrapped Up! Be the first to review Christmas Wrapped Up!! Got a question? No problem! Just click here to ask us about Christmas Wrapped Up!. Details for Christmas Wrapped Up!